I love cooking with fresh herbs and using different spices to really boost the flavor of my food dishes. Let’s face it though….sometimes I just have to go to the pre-mixed seasoning packets. Actually, there are some really good ones in the grocery store that I enjoy using in a pinch. However, I could never find a good place to organize them. I tried wicker baskets, glass jars and wire baskets. But, I never liked the look of any of them or not being able to see at a glance what I had. 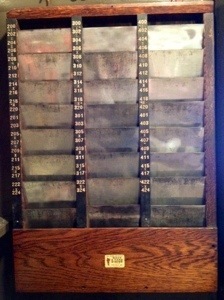 Then, my mom and I were having a garage sale and lo and behold, she was selling an old hotel card rack system. Score! 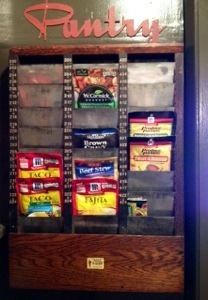 I just found my new spice packet organizer. Made of wood, it had a slot for each room number and had the original label identifying the maker. Originally, I have been told it was used either at the check-in desk or in the kitchen for room service orders. (Of course, I forgot to take a before picture!) but, here it is after we removed every third metal divider. The seasoning packets were too thick to fit between the original slats, so we had to make some adjustments to the number of metal dividers we put back in. It was a snap to take apart (well, at least it was for me watching Shane do it) and of course I gave it a good spit and shine with Murphy’s Soap and Old English Polish. It really makes a difference on the old wood. In between the wash and polish, I used a dark wood stain pen to color in any chips in the wood. I usually like the look of rustic & beat-up vintage wood; however, some of the chips in the wood were deep gashes and needed to be stained. Shane also cleaned and polished the metal dividers. 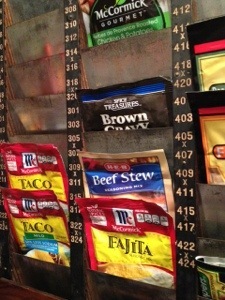 The Hotel Card Rack is super heavy duty and I love the way it looks in the pantry…the perfect functional and decorative spice packet organizer!